Life Athletes, hello and welcome to episode 180 of the Life Athletics podcast. 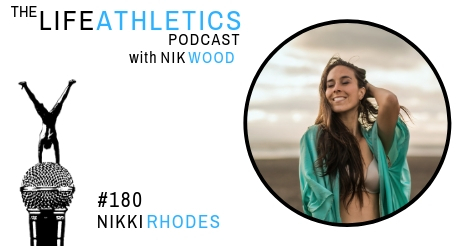 Today’s guest life athlete is Nikki Rhodes. Nikki Rhodes is a passionate advocate for authentic relating and positive sexual education coaching both men and women. She has a degree in psychology, childbirth education and was a lecturer at the University of Auckland in Ancient Greek and Roman Medicine specialising on issues surrounding women's health and sexuality in the ancient world. A devoted traveller and student of life always, she continued her study of traditional Tantra in India earlier this year, as well as presenting workshops at Bali Spirit Festival, Byron Bay Spirit Festival and various retreats across Australia and New Zealand. She is the co-founder of NZ Spirit Festival, an annual alcohol-free wellness, yoga, camping and music festival, Resolution NYE Festival and NZ Yoga Day under the events company NZ Spirit. She is the mother of three wild daughters and spends the Summer months in New Zealand and the Winter living in Bali.